Myrtos Attractions – What to in Crete? Myrtos is a small seaside village, located not far from Ierapatra, on the island of Crete in the Mediterranean. It offers a leisurely pace of life and the chance to relax and get away from it all for a few days or weeks, all in pleasant and picturesque surroundings. What to do in Myrtos? One of the best things about Myrtos is its beautiful and unspoiled beaches. 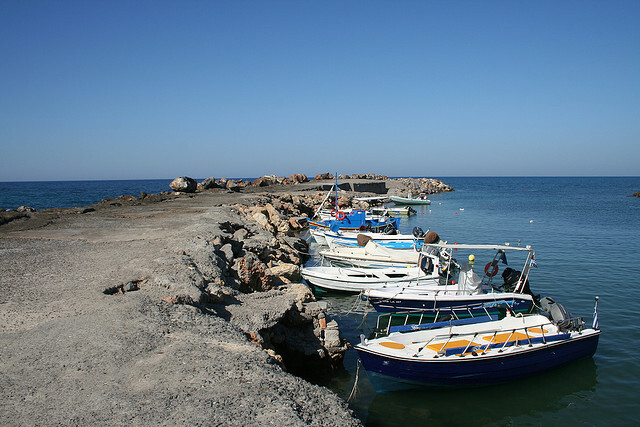 The town’s beaches suit all tastes and range from quiet and peaceful to lively and frenetic, with all the usual diversions and water sports. The beaches consist mostly of the distinctive ash grey sand found on the island, which contrasts with the inviting turquoise water. Regardless of which beach you choose, banana and orange trees form a natural backdrop. Although Myrtos offers several options for accommodation, there is also camping in nearby Tertsa village. The road from Myrtos to Tertsa is worth taking for the scenery alone, with groves of tamarisk trees growing alongside the road. A popular day trip from Myrtos is to Lerapatra and the South Dikti Mountains, which takes you through some of the most spectacular natural scenery on the island. One of the highlights of this area is the Agios Antonios church, considered to be an architectural masterpiece. Despite the visiting tourists, it still manages to retain a sense of peace and quiet. Another man-made site that is worth a visit is the remains of the Minoan settlement in nearby Pirgos. But one of the best things about a visit to Myrtos is simply the chance to relax over a drink in one of the village cafes, some of which seem little changed in centuries. Whether you visit for the scenery, the beaches, the relaxed pace of life or for the surrounding historical sites, the village of Myrtos and the nearby area has something for everybody.